Greece, particularly the islands, are some of my favorite escapes. Did you know there are 6000 Greek islands in total with only 227 inhabited? There are so many landscapes and cultures to discover. The Greeks are extremely friendly, their history rich, and their cuisine is the healthiest in the world. For a treat, I booked a 6-night stay to visit Santorini in the Cyclades Islands. 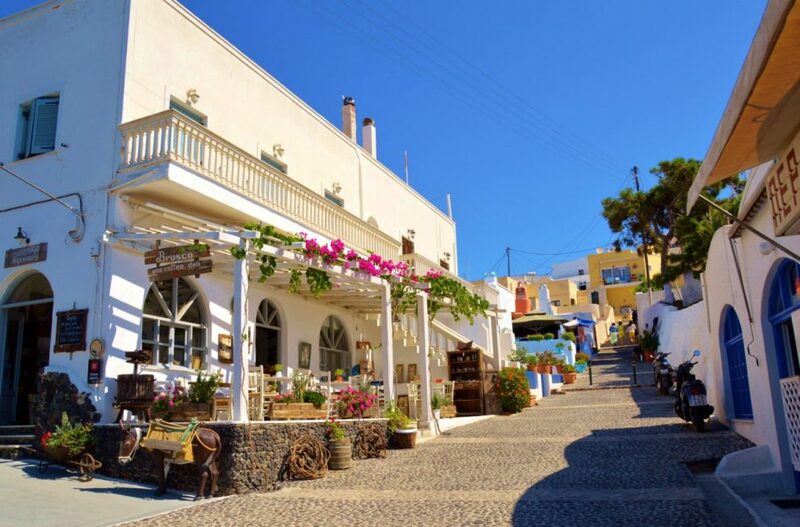 There are plenty of things to do in Santorini to keep your busy for awhile. This is the first time I’m visiting this Greek island, so if you are wondering what to see in Santorini, keep on reading. 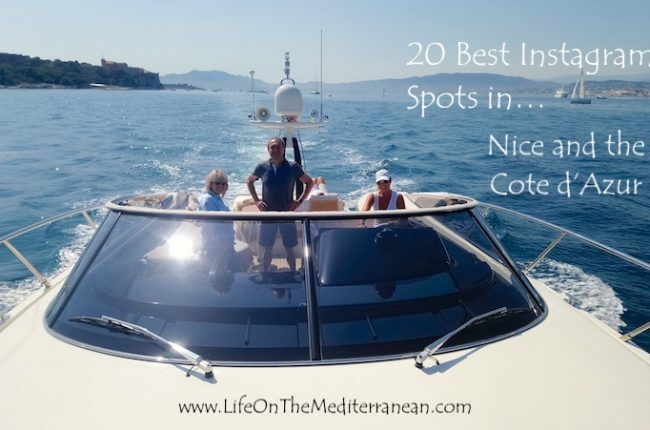 Otherwise read The Best Greek Islands to visit for more suggestions. You might be interested in this Greek Islands Travel Guide. Ok. It was a bit of a splurge. My on-again, off-again relationship was off again, and I needed a change. Some women buy chocolate, some hit the department stores, but not me. I buy travel. Nothing gets my mind off of reality like sunrises, sea views and a flirt from a hot Mediterranean man. I just wanted some fun things to do in Santorini to enjoy myself. 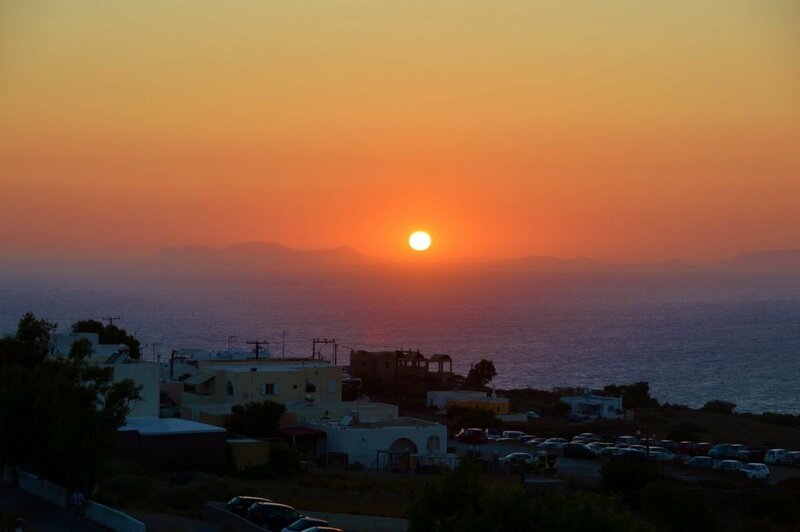 5 Enjoy Magical Oia and see the sunset! 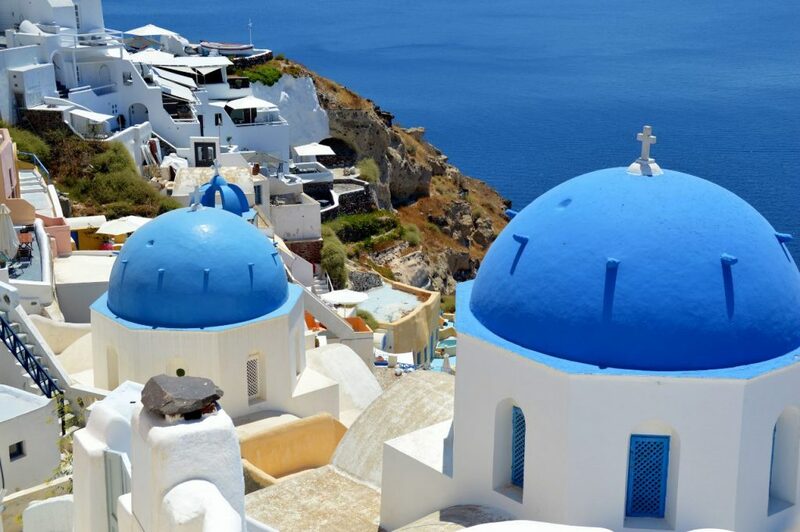 Unless you are flying into Santorini on a direct flight from one of Europe’s many local airlines, chances are you will have to first fly to Athens. 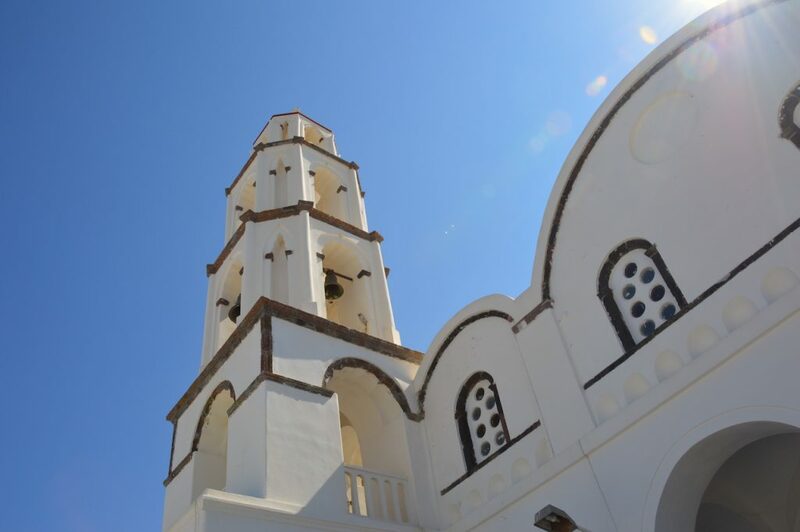 There are numerous flights on Olympic and Aegean Airlines in and out of Athens to Santorini. And what a fantastic city Athens is. I always recommend a few days in Athens to absorb the amazing history, culture and culinary treats this beautiful city has to offer. Then chill out on the islands. I was going in high season, and I knew Santorini would be crowded in summer. I needed to be methodical about what to visit in Santorini. 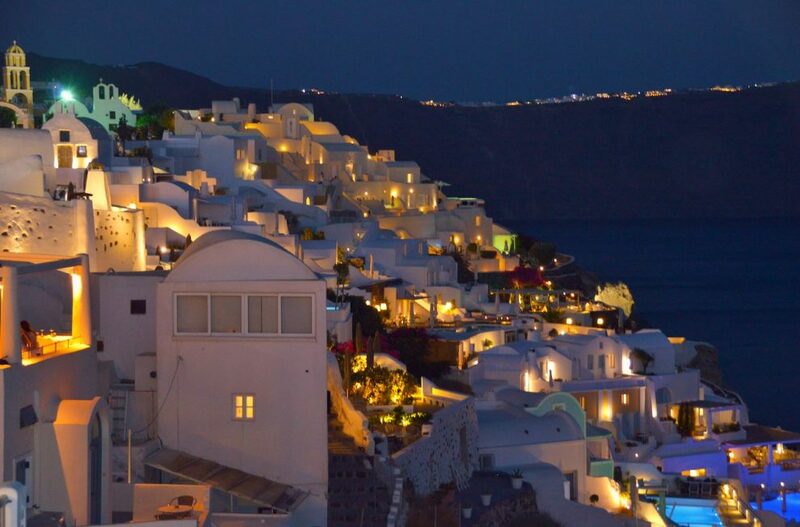 Since the island is not very large, I could easily visit most of Santorini within the six days I would be there. I decided to I split the island into 3 parts: Pyrgos in the southwest, Oia in the north, and Perivolos/Red Beach in the southeast. Pyrgos is a quaint village of a bit over 900 people. It’s a quick ride from the airport and the least spoiled of the villages on Santorini. It’s quite charming and relaxed with only a few restaurants and shops. Stroll the steep steps up to the cathedral to the top of the village to enjoy a magnificent panoramic view. Brusco’s Cafe, by the roundabout is buzzing, and for good reason – it’s the afternoon and they have coffee, wine and WiFi! You sit under shady trees while watching the world go by. This is a great place to chill on Santorini. It’s also where the local bus stops to other parts of the island. I love staying in boutique hotels and I’m in luck. 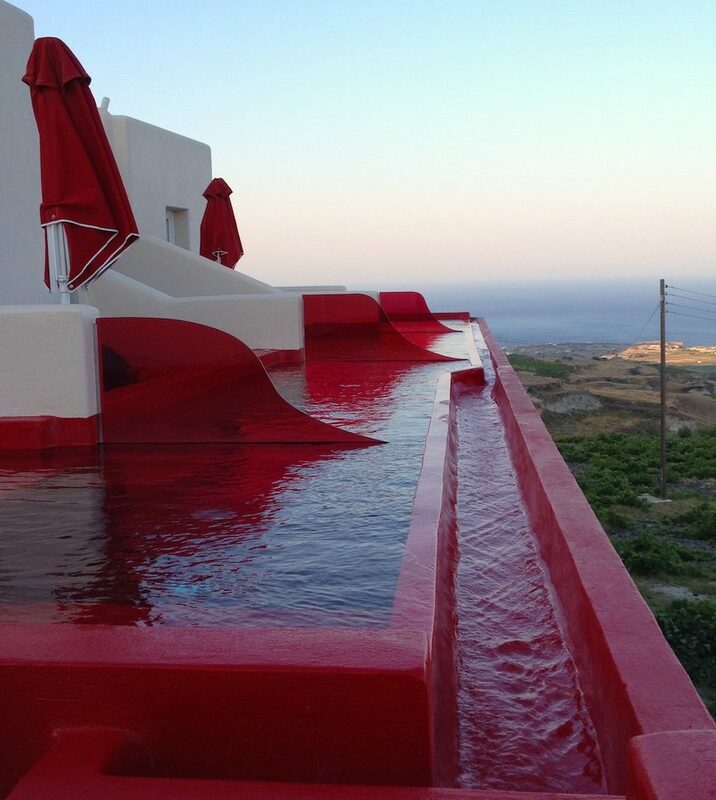 The Art Hotel Santorini, is a super boutique hotel just at the edge of town. It’s a 10-suite, sea-view hotel and the rooms come with a private terrace and plunge pool. I booked the Nest Suite at the Art Hotel and it was a very spacious suite. Wow! The blood-red tiles reflect something sinister may have happened. At night, it glows! It’s nice and warm and makes a bold statement. Against the blue sky, the private plunge pool has a massive, ‘Wow’ factor. Private plunge pool in Santorini. 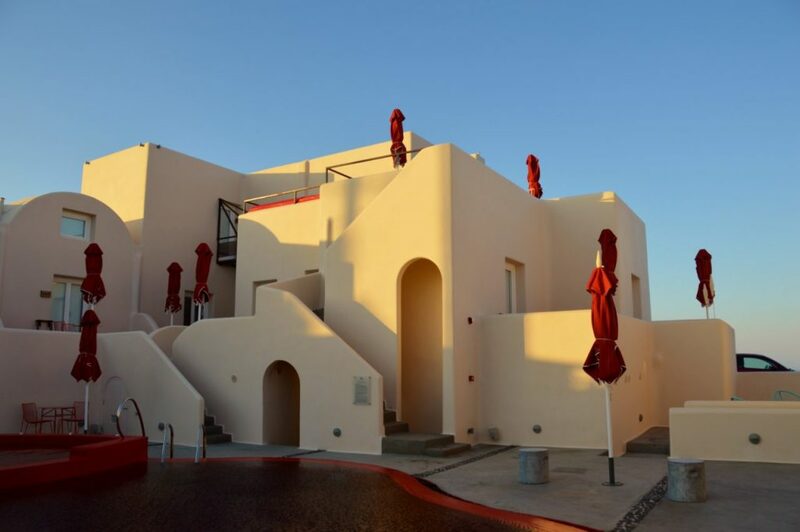 As the name implies, the Art Hotel Santorini is a canvas for national and international artists, feeding the tastes and trends of the sophisticated, contemporary Greek art scene. There is a new installation each season, along with concerts and talks to coincide. You can even admire art while you are swimming in the main pool. It’s a very creative concept, and what a wonderful way to support the arts community. It is so ‘chill’ to simply linger in my own private pool, and I admit, I relish the quietude. 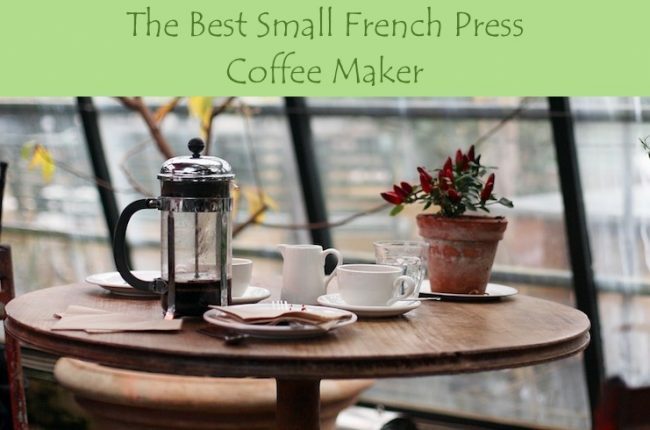 The only break in silence is the occasional moan coming from the couple next door. Lucky them. No screaming at the pool, no children crying. It’s zen. Since there are only 10 suites, the service is excellent. Staff are extremely attentive. Breakfast is included and menus are set out the night before. It’s made to order at the time you request. Breakfast is then set up on your terrace in the morning. You can choose from omelettes, Greek yogurt with honey, Greek salads, plus more, including champagne! Its a very chic experience first thing in the morning. There is no restaurant so you may order a private dinner as well to be set up on your terrace. Very romantic. Looking forward, room rates for October 2018 are around $132 per night. 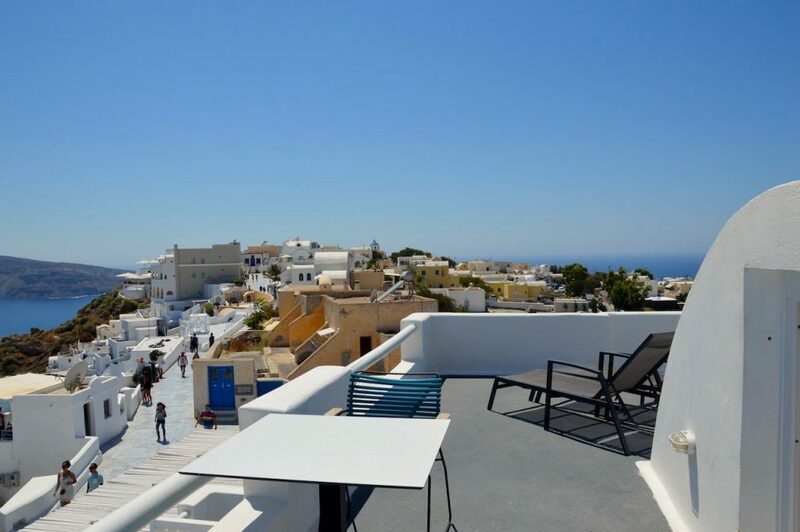 This is a great price for a boutique hotel on Santorini. 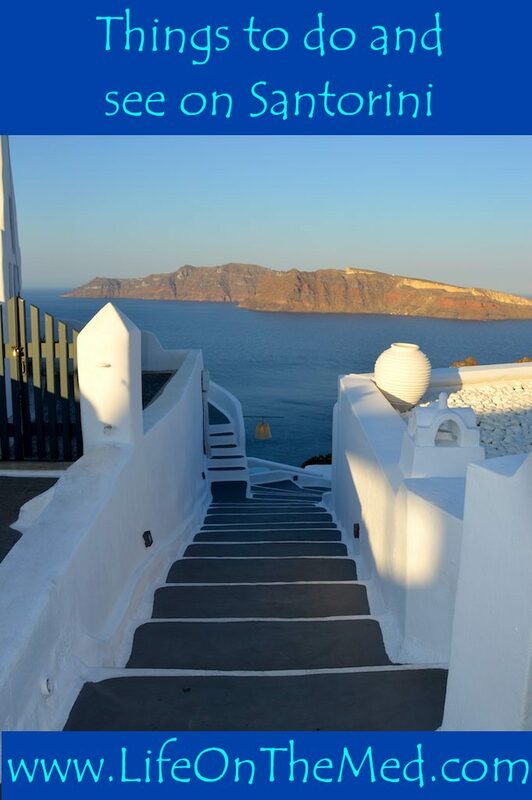 Enjoy Magical Oia and see the sunset! I now hop on the bus to the opposite end of the island to the town of Oia. 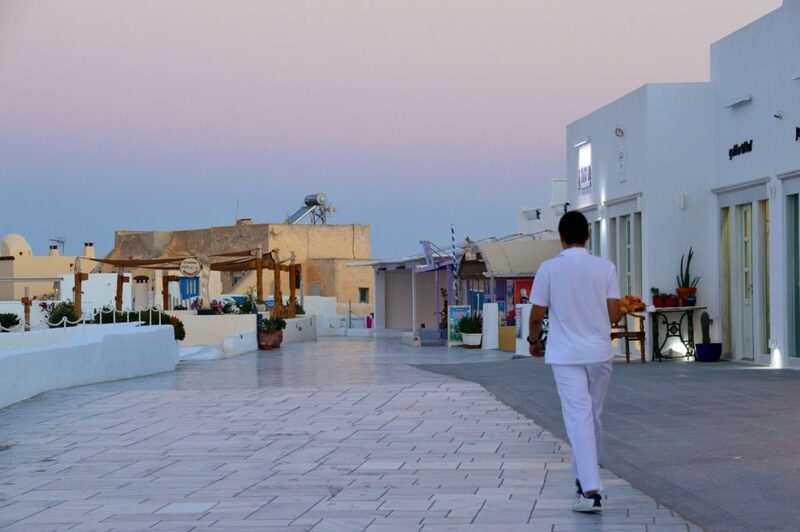 When you see photos of Santorini, it’s predominantly Oia. The bus company, KTEL, manages the bus network and it’s clean and efficient. The main bus routes in Santorini run quiet frequent, usually a couple times an hour, and offer inexpensive transfer from point A to B. Ticket prices range from $2-3, and night buses are slightly more. There is absolutely no need to rent a car on Santorini. Like many, I was keen to get ‘that shot.’ You know, the one with the Blue Domed Church. Well, here it is. The bright lime-water whitewash sears your retinas as you squint to take it all in. Everything is so bright against the contrast of blue. Oia’s permanent population is 1,550 and increases substantially in the summer. It’s a chic, expensive village, and a visit for cruise ship passengers. It gets really busy and feels like a duty-free stop. Don’t get me wrong, it’s beautiful. Book in the off season so you can enjoy it more to yourself. In Oia, I’m staying at another boutique hotel at the Aisling Micro Hotel, and micro it is! There are two spacious, well equipped, contemporary suites. I have two floors with a large living area, a spacious writing desk with an Ipad and cell phone, and a sea view Jacuzzi! There is a terrace on the main floor, and upstairs is the bedroom and an even larger terrace! I’m in the center of the action and room rates for October 2018 are about $315 per night. This is a great little boutique hotel on Santorini well worth the splurge if you want to be in the heart of Oia. People come to Oia for the sunsets. If you want, you can take a sunset cruise on Santorini. Otherwise, people converge each evening at the far end of the island to experience this. Luckily, I didn’t go anywhere. I just sat on my terrace, glass of wine in hand, and listened to Richard Edward’s Smooth Jazz program on the internet. How sublime… A perfect complement to a wonderful view. Oia is definitely a more vivacious town on Santorini with the buzz of restaurants, clubs and nooks to keep your photographic interest. The best time to explore Oia is at sunrise. It’s empty – a far cry from night time. I was able to snap some amazing photos without dodging bodies! It was me, a few dogs and cats, and the occasional baker delivering croissants. 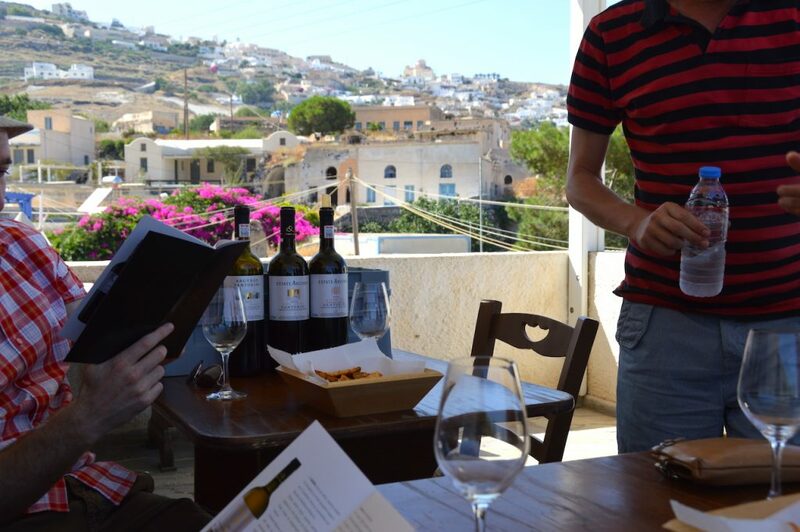 Another fun thing to do on Santorini is book a tour with Santorini Wine Adventures. I visited Domaine Sigales, Estate Argyros and the Koutsoyannopoulos Wine Museum where we learned about wine making and tasted 12 different types of local Assyrtiko and Vinsanto wines which come from Assyrtiko, Athiri and Aidani grapes. This day tour was about $100 and a great course on wine production on Santorini. The next time I need to try their Wine and Food Lovers Tour which includes a cooking class! I love dabbling in local cuisine. Due to the heat, the vines grow in a circle on the ground. 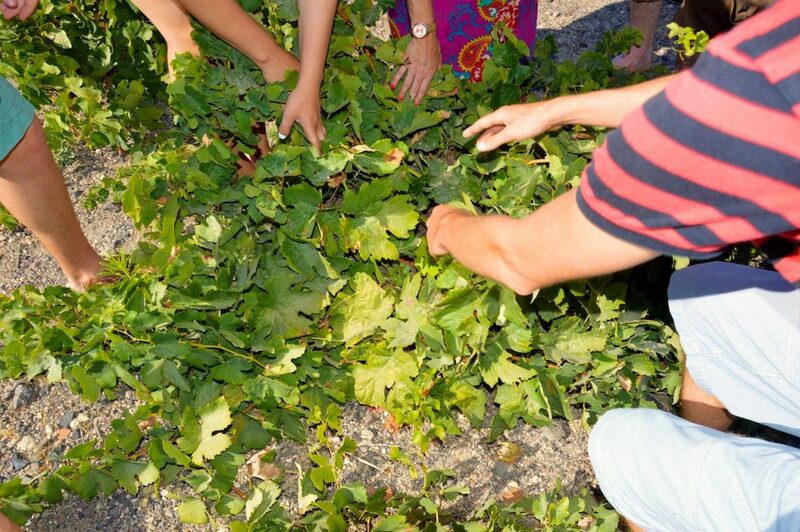 That way, the humidity from the soil and shade from the leaves help the grapes grow. The vineyards are flat and appears quite unimpressive, but when you get up close you see the winding vines. You have to be careful near the vines because you might find a snake seeking refuge from the heat! When you are on Santorini, you must visit the covered ruins of the ancient Minoan Bronze Age settlement of Akrotiri. 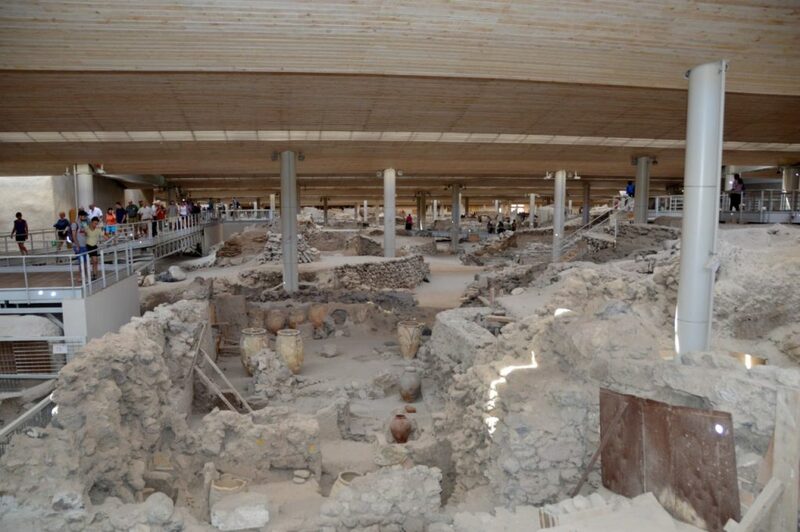 Akrotiri was covered by a volcanic eruption in 1627 BC and the excavation has been going on since 1967. There are wall paintings and ceramics to see lying about and it’s an amazing place to discover. It’s quite an interesting bit of Santorini history, and at €12, it’s a small price to pay to visit these amazing ruins. My time in Oia had come to an end, so I took a local bus down to the Southeast part of the island to Perivolos beach. I planned to stay 2 nights at a beach front resort. Unfortunately, the resort was beach front, but extremely tired and lifeless. 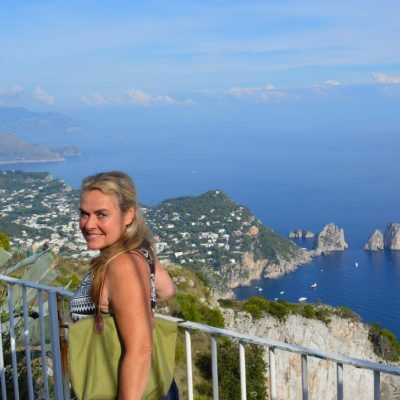 I was spoiled by my previous 4 nights in a boutique hotel, and expectations were high. The black, volcanic beach was in desperate need of a raking and cleaning, and it didn’t even seem like the same island. I won’t mention the name of the hotel as I wouldn’t recommend it. 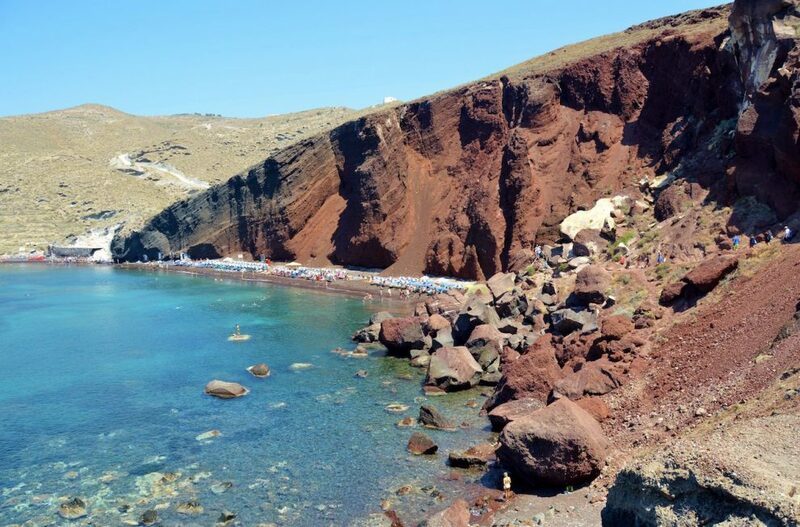 I took one more independent bus trip over to the most famous beach, The Red Beach on Santorini, so called due to the red and black volcanic rock that’s been sliding off the face of the cliff. The colors were quite spectacular and surreal, and it’s a great place to visit for an afternoon of you want to swim on Santorini. I woke early again to shoot some sunrise shots from the beach. Quite lovely! This trip to Santorini was just the ticket. I left feeling energized and glad I booked on a whim. There are so many things to see on Santorini and six days didn’t feel too short nor too long. It is easy and reasonably to reach Santorini from the UK with many low-cost carriers and tour package operators. 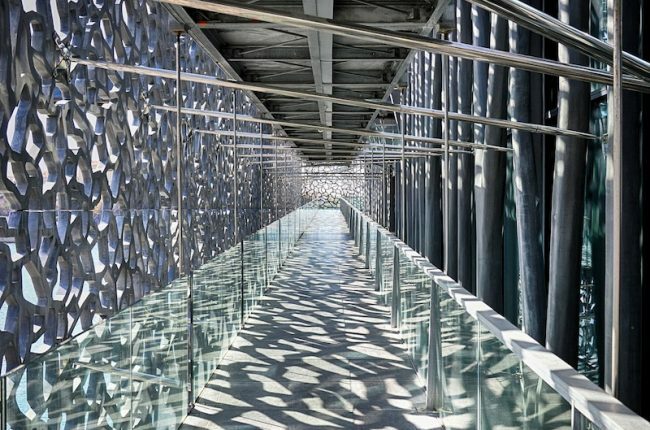 Otherwise you need to connect through Athens, which is also well worth a visit. I love Athens, and here’s a great itinerary for 3 things you must see in Athens. Many European cities offer direct flights as well throughout the high season, and within Europe. I prefer to take the cheapest flight possible since the flight is so short – then splurge on a swanky boutique hotel and interesting cuisine. For more information on Santorini and the wine tour, click the links above. 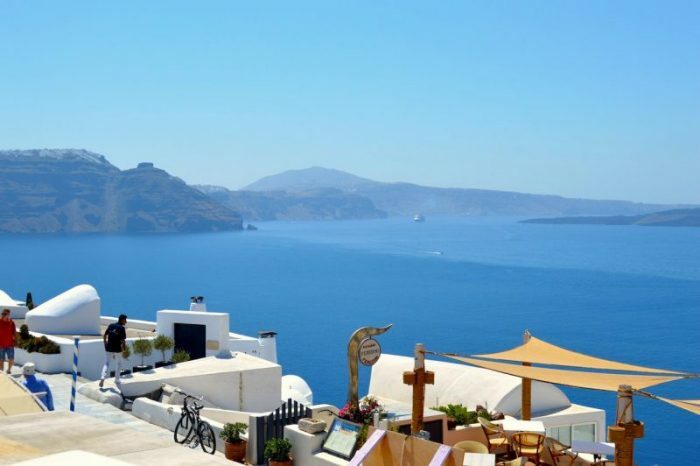 I highly recommend both hotels for location and service, so visit the Visit Greece website is a good place to start for information about what to see and what to do on Santorini. Santorini is still on my bucket list. Great post and great photos! Thanks, Lisa. Santorini is very navigable. Quite easy to get around by bus and you’ll see totally different parts of the island. Hope you get there one day. Santorini will always be my most favourite destination. Your post and pictures made me so nostalgic ???? 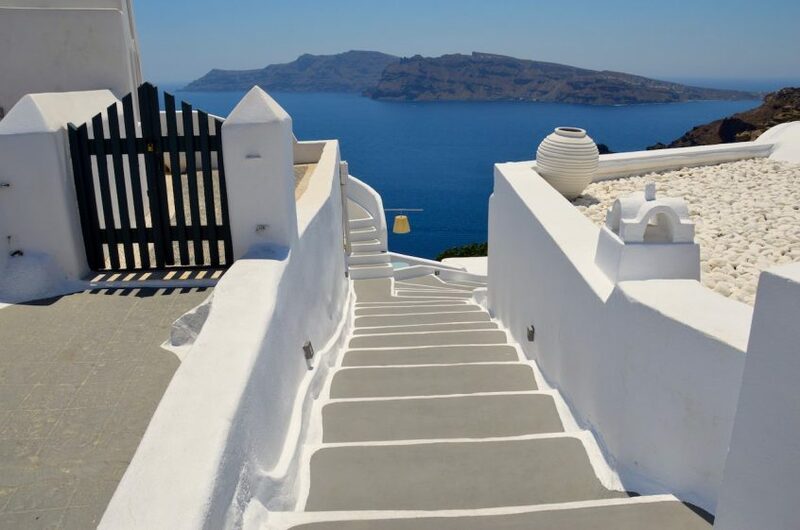 Thank you, Chandrima – I, too, love Santorini, and the Greek Islands in general. They are so photogenic and each island is so unique. I hope to explore and talk about more of them. Stay tuned! Santorini is high up on my list and honestly this post drove my urge up high!! I love the pictures, the hotel recommendations and the drone video of the sunrise is just so mesmerizing! Thanks Shibani. It is such a beautiful place that it’s easy to photograph. That drone is amazing, right? That is one thing I want to start doing – droning. Let’s see. Keep in touch!